Pepe´s House i Cuenca, Ecuador: Bestill nå! What a gem of a place, lovely location and super friendly staff. The $3 breakfast was also a nice treat. We only stayed two nights, wished we could have stayed longer. After days of bus travel the double beds for everyone in the dorm room was such a luxury. 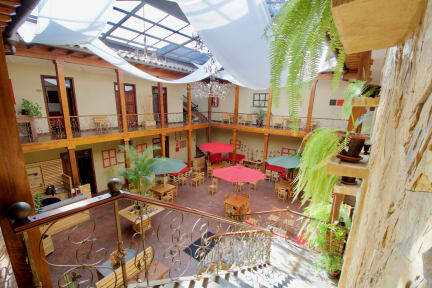 The rest of the hostel is lovely too, beautiful common area, friendly cat, best beer from next door we’ve seen in a hostel in ages and really nice and quiet. Missed lockers for valuables, but dorm rooms are lockable and you do get a key.